Hello everyone! Today I have a project to share for the Feature Friday at Pretty Little Studio and this time we're putting geo tags in the spotlight. I think geo tags are some of my favorite embellishments, of course they go really well with all kinds of travel pages I make, but they easily fit in everyday subjects as well. I decided to not go for the obvious, a travel layout, I've made a card today. It's time to think about our next travels, so I'm going to send this card to my travel buddy. I used a piece of white cardstock for the base of this card and covered it with one of the Let's Go vellum sheets. 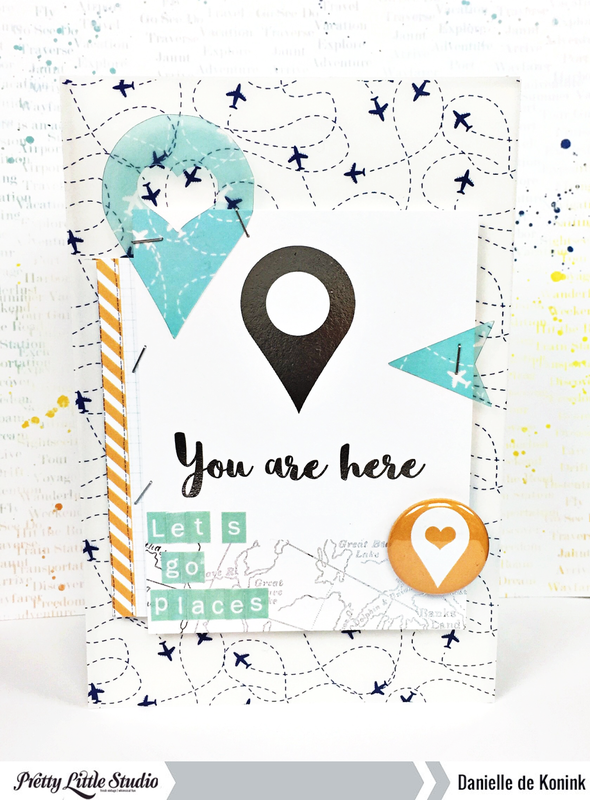 Then I made a cluster with one of the journaling cards, along with a note cut out, some clear shapes and a flair button. I added a sentiment with the Tiny ABC Ocean Blue.